Spare a thought for the common domestic garage: without a doubt, it's that space in our homes that rarely receives anywhere near as much attention as it most likely deserves. Out of the way, hidden in the backyard, full of boxes and miscellaneous goods that we've thrown in for years on end, the garage is too often overlooked in the interior design mix, which is a shame really, because the garage actually has the potential to be one of the most vibrant, exciting and well-functioning multi-purpose spaces in the whole domestic set up. It's true! Whether you typically use your garage for vehicle storage, tools and hardware, or simply as a refuse holding box for all the things you should probably have thrown out years ago, having a clean, clear and well-designed garage—inside and out—ought to be an absolute domestic priority: one that'll help to create a truly harmonious, vital and aesthetically pleasant home. Today on homify, we're taking a look at a few fabulous examples of what can be done when it comes to the humble domestic garage space: if your messy shed is in need of an overhaul or revamp, or you're thinking of building one from scratch, take a look at these excellent ideas and get excited about the possibilities! Nothing is finer than a sleek, contemporary and ultra-modern garage set up. Some might like something a little more rustic, a little more country-style and traditional, but (depending on the stylistic proclivities of rest of your home) a modern touch truly can be the perfect style for your garage or shed space. 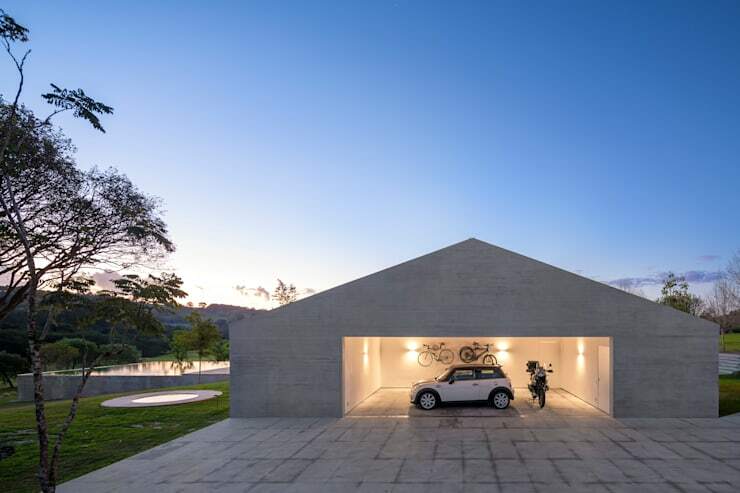 The example here really shows us what's possible: a fabulously designed, and perfectly appointed, modern-style garage building: sturdy, reliable, and almost monumental in its concrete-clad, pitched-ceiling facade. Constructed with ample space, cars and bicycles are given ample space in this garage interior, brilliantly lit with an artful array of wall-affixed lighting, which illuminates the space like a hallowed haven. Choosing the right style of garage can be a huge project to undertake if you haven't done anything like it before. If you feel you could do with a little extra advice, wisdom or guidance, why not chat to a professional first and start on the right foot? Above and beyond any other consideration when it comes to the outlay and design of your garage is how you treat it once it's standing. As we've already mentioned, the garage and shed space is notorious for attracting clutter and mess, so great attention ought to be spent on making this space as clean as possible. Here in this example we are shown a brilliant illustration of a well-organised garage. Industrial in style and form, the space utilises raw and rugged design elements to create a usable and ultimately practical area. The exposed pipes to the top left hand side of the image are typical of many industrial spaces, and when paired with the large pendant light fittings gives the impression of an edgy yet functional abode. Finally the polished concrete floor, timber table, and ample storage are the icing on the cake with this brilliant garage. These days we are seeing technology evolve at a rapid rate, far surpassing anything we have encountered in previous decades or generations. Big advancements are being made in almost every realm of the human experience, and architecture is one of them. There are no boundaries when it comes to designing your new home, and in turn your garage can become virtually anything you desire. So perhaps your tastes are more suited towards opulence and luxury? 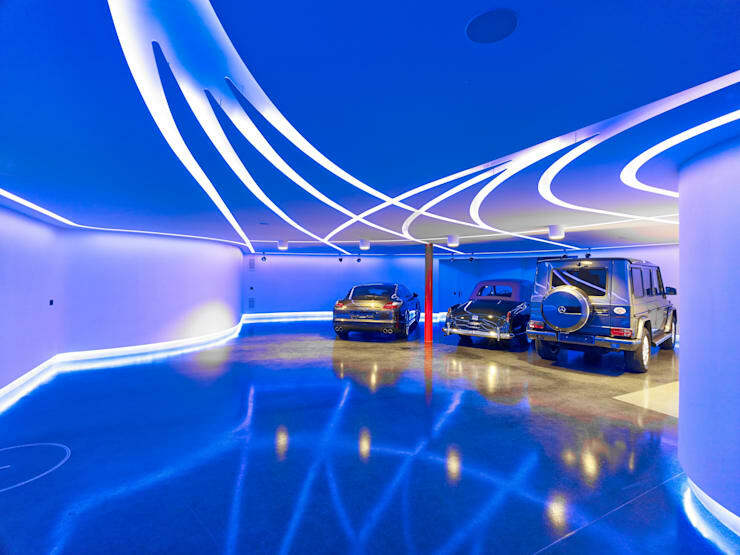 If this is the case you will undoubtedly enjoy this next futuristic garage. We hesitate in even calling this space a garage, when in actuality, it looks more like a gallery for a collection of striking automobiles. Replete with bright blue illumination, and a high gloss floor, this space is large, luxurious, and ideal for anyone wishing to show off their penchant for excess. Many attempt to achieve minimalism within their garage space, but few rarely succeed. Unfortunately, the nature of a garage is one that tends to attract mess and clutter. This next example however has baulked the trend, and created a space of tranquillity and serenity. 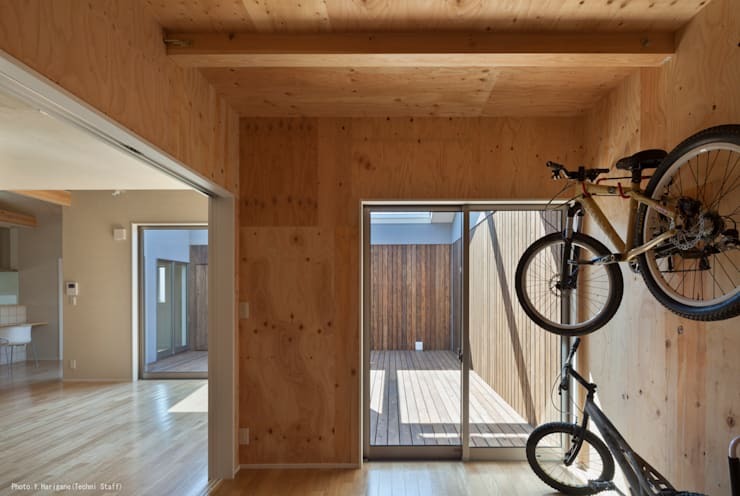 Oozing style with timber-clad walls and ceiling, the space has ample storage areas for bikes, and can double as a functional entertaining room. Here at homify we hear the word rustic a lot. From kitchens to bedrooms, studies to bathrooms, you are hard pressed to find an individual who hasn't either lived or decorated rustic at least once in their lives. Rustic design is ubiquitous with the countryside, and consequently provides that earthy charm that many desire within their homes. But what about the garage? 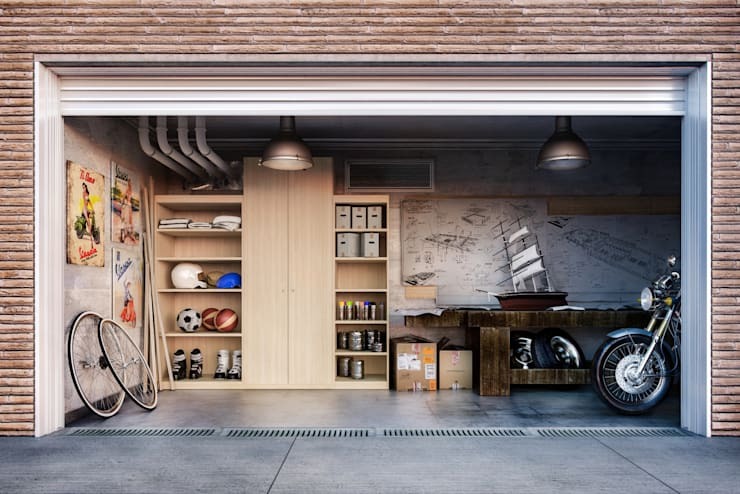 No less important to the rest of the home, a rustic garage can offer a place to store one's things, organise tools, and create a stylish getaway for both yourself and your vehicle. This example is a perfect demonstration of rustic timber garaging at its finest. Replete with ample wooden finishes and accessories, the space manages 'functional organisation' without feeling unwelcoming or hard-edged. Well-illuminated, usable, and effortlessly versatile, this is a striking example of smart design. Last but certainly not lease we check out the classic country style garage. Perfected over many years, this is your go-to all-in-one car home. Often constructed in a similar style as the house it adjoins, the classic free-standing garage is ideal for those who are looking to expand their storage space without a drastic or dramatic new build structure. 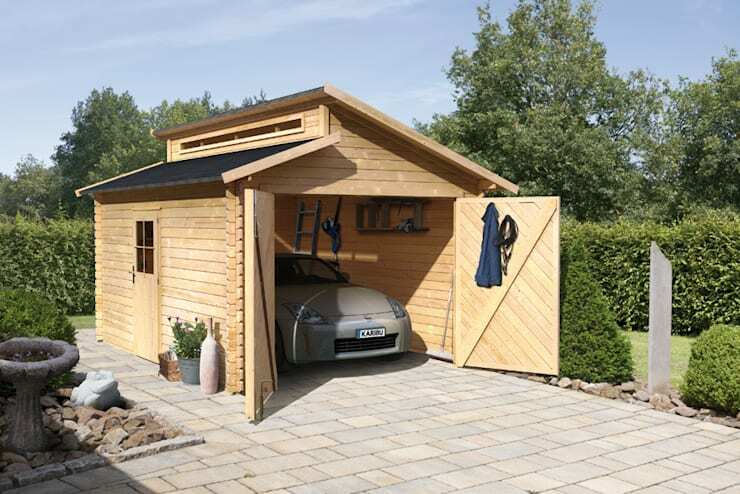 Often fairly lightweight yet sturdy, a timber garage generally doubles as a shed, and can additionally provide space for individuals to entertain, or create their own den or hideaway. Easily installed, and perfect for an experience DIY home builder, these timeless garages are pretty, inoffensive, and a stylish addition to any traditional home.